Sooner or later, the talking points will be about alternative sources of dairy like soy or rice milk to reduce our dependence on dairy cattle. At least that’s the crisis the June 27 “World News with Charles Gibson” portrayed. A report by ABC correspondent Betsy Stark suggested that although Americans are seeing lower prices at the pump, they must face the newest economic problem – the rising price of dairy. ABC News has only reported the decline in gas prices twice in its nightly newscasts since they began to go down right before the Memorial Day holiday. 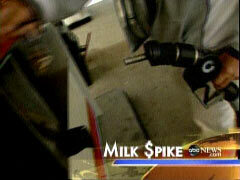 Gas prices have gone down on average 24 cents nationally and this was only mentioned on two broadcasts. And although the amount Americans spend on dairy on average is far less than what they spend on gas, Stark spared no hardship story about the rising costs. She even managed to draw parallels between milk and gas prices, suggesting the global market of milk has our prices on the rise as China and India begin to have an increased demand.